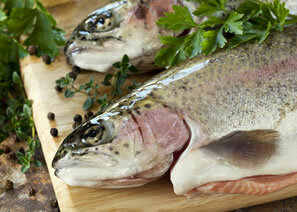 In the beginning trout production was carried out using clay pools and fresh water. As well as clay and concrete pools, recent years have seen rapid development of other types of container so that now clay and concrete channels, baths and tanks, silos and pens are all being used for commercial trout production. Our company recognises the importance of trying to produce trout as close as possible to the natural fish, hence we take special care to ensure our trout are in top condition and are a natural colour as would be found in the wild. We believe this is why so many buyers and marketing professionals prefer our products. The clay rearing ponds used on our sites are as near as possible to natural pools. All of these measures, together with certain fish food additives, result in the fish meat being the desired colour. Ponds used for rearing trout are different in both design and construction from ponds used to rear other fish. In general the water flows very fast delivering large quantities of oxygen, and waste in the pools is quickly swept away usually into a long, thin channel-type pool. Ponds may be constructed from clay, concrete and some types of fibreglass. Trout for the table reared in ponds can vary in quality to a high degree according to the dimensions of the ponds in which they are kept, the rate of flow of the water and water quality, as well as the topography of the site. The production process for trout in ponds begins with the fertilisation of the eggs. The basic aim of production is to hatch fertilised eggs and then rear those hatchlings to become table-ready trout. The weight of a trout for the table has been agreed at 250-330 gm per fish. To ensure that our fish reach customers in as fresh a condition as possible we place great importance on refrigerated transport. Our company also prepares smoked trout and trout fillets, and these are amongst the products that we export to countries in the European Union.